Some people spend years trying to get into the beer industry. Others stumble into it. Kerry Claydon was one of the latter. Like most of us, Kerry didn’t even like beer as a teenager, finding it to be too bitter. She came to enjoy it in the ensuing years, particularly during her ten-year stint playing professional basketball. But she’s a scientist at heart, and her long-term chosen career path was in microbiology research. But what does microbiology have to do with beer? Well, it has everything to do with it. While not everyone who works in beer has to understand all the science going on within the brewing process, it’s helpful to have people like Kerry around – people who have an idea what those tiny little creatures are getting up to. Kerry was as surprised as anyone when she took her first job in the beer industry, and has since put her brain to work on both the macro and the craft side of the fence, currently working as brewery production manager at Balter Brewing. But she also has another role in the beer community – as the coordinator of Chicks With Ales. The "other" CWA is a group for women who have just started drinking beer and women who have been drinking beer for years. It’s for women who homebrew, women who work in the beer industry and women who are just discovering all the flavours and styles that beer has to offer. 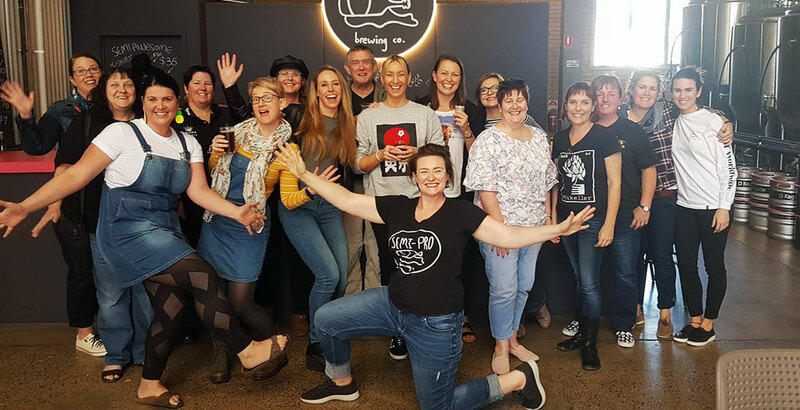 CWA runs events centred around experiencing and learning about different beers together, but it’s also just a way for women to hang out over beer. Enjoying beer has long been a male-dominated pastime (do beverages have genders? ), and the beer industry has been a home for all kinds of discrimination and sexism along the way. Though society in general and the craft beer industry in particular are making positive movements towards equality in this sphere, there’s still some way to go, and so CWA provides an inclusive and safe space for women who have felt judged or looked down upon when they ask bartenders questions about beer. 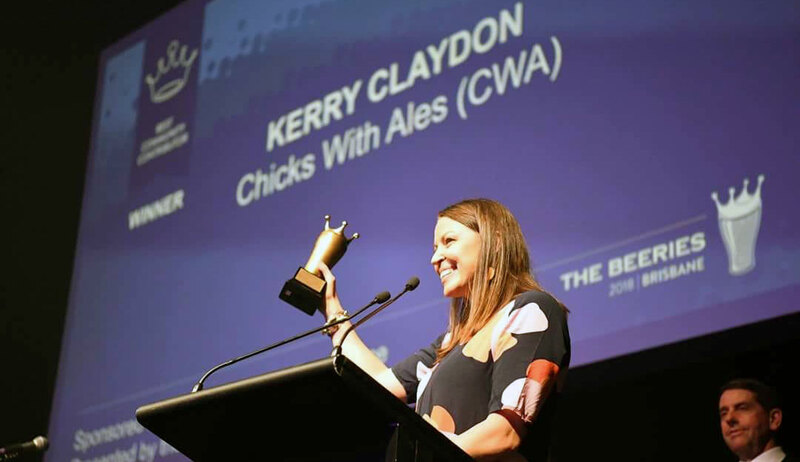 At the 2018 Beeries awards, the Brisbane beer community collectively acknowledged the great value of all that CWA does, and Kerry accepted the Gold Beery For Best Community Contributor on behalf of the group. Since Kerry’s been in the group, they’ve run beer education events, taken part in brewery tours and tastings and taken part in with brews at different breweries. They’ve also started a homebrewing group, where they brew a particular style of beer together and talk about what judges would look for in examples of the style. And, with sensory sessions, beer and food matching events and collaboration brews lined up in the next twelve months, they’ve got a busy time ahead. Kerry Claydon collecting a trophy on behalf of Chicks With Ales at The Beeries 2018. 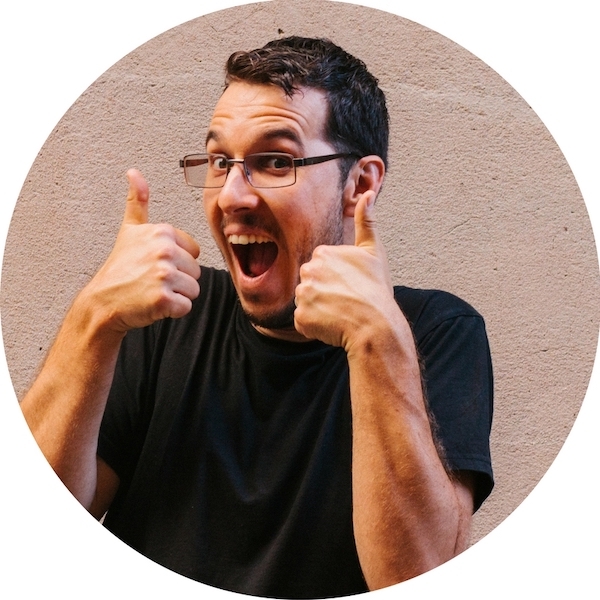 HOW DO YOU FIT INTO THE WONDERFUL WORLD THAT IS CRAFT BEER IN AUSTRALIA? I always like to say that the beer industry found me. But I found the craft industry. I initially started as a contract microbiologist for XXXX over six years ago. After three years, I was poached by CUB and went on to become their national microbiologist. After the AB InBev takeover, I was really keen to transition to a company I was more passionate about. In 2015, I joined Newstead Brewing as their head brewer, before joining Balter earlier this year. It has been a wonderful experience to see how different breweries operate to gain an understanding of what works well and what doesn’t. WHAT DREW YOU TO WORK IN BEER? I was working a fantastic job in the science innovation team of the Queensland Government when Campbell Newman came to power. After spreading my resume wide and far, the XXXX Brewery contacted me to offer me a contract position. I couldn’t believe my luck that there was such a position for a nerdy microbiologist like me! It’s been a fascinating industry to learn but, in all honesty, I’ve learnt more whilst working in the craft industry than I did working in the commercial breweries. Everything is so automated in the commercial setups; while it’s good for producing consistent results, it doesn’t really assist the learning process. HOW LONG HAVE YOU BEEN PROMOTING BEER IN YOUR OWN PARTICULAR WAY? Six years in the industry, the last two in the craft industry. I have become such a sales person. Craft beer is like a Thermomix: once you have one, you automatically become a sales person because you just can’t understand how people can live without it! Quality matters. Independence matters. To me, anyway. In the craft breweries I’ve worked at, neither have used sugar as a substitute for grain; neither have used liquid hops extract rather than hops themselves; neither have used Caramel/RL20 rather than malt to colour their beer; neither have used enzymes to break down the unfermentable sugars rather than leaving these in the beer to create good mouthfeel. All these things matter to me as a beer consumer. WHAT'S BEEN YOUR PROUDEST / HAPPIEST MOMENT AS A CRAFT BEER ADVOCATE? Doing the Hottest 100 Craft Beer countdown with legendary Matty K (founder of Brews News) and, when announcing Balter to be the winner, turning to Mick Fanning and throwing down a shotgun tinnie challenge. We won’t mention who won. DESCRIBE YOUR CRAFT BEER UTOPIA. Working at Balter?? Haha… just joking (not really). Although I am really proud to now work for the company that produces my favourite beer. WATER, MALT, HOPS OR YEAST? Of course I am biased – yeast is the superstar. Without it, we have a non-alcoholic bitter beer cordial. Kerry (sixth from left) with some of Brisbane's Chicks With Ales. HOW DID YOU COME TO BE THE COORDINATOR OF CHICKS WITH ALES? I was discussing with a few awesome women in the industry if we should start up a Pink Boots Society chapter in Queensland. 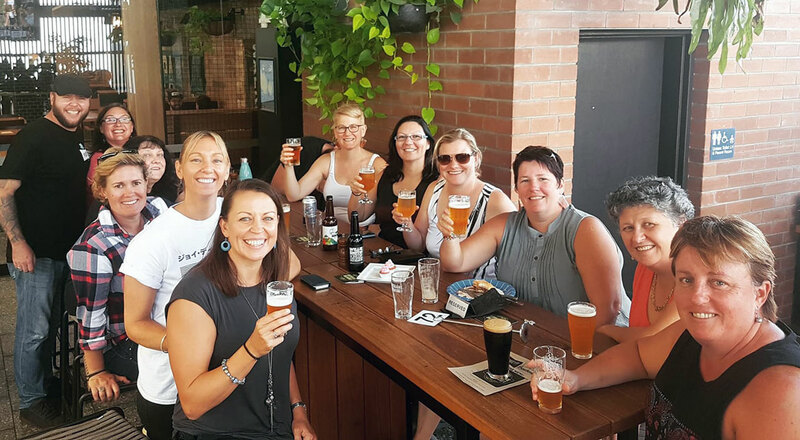 Given that PBS is specifically for industry folk, we decided it wasn't quite the time to start a chapter, considering women in the brewing industry in Queensland represent only around five percent of workers. Therefore, it made better sense to support a space that was inclusive for all women, not just those that work in the beer sector. I was more than happy to take the lead to reinvigorate CWA, a group created back in 2012 by Linda, Donna, Kate and Jess. The group had gone defunct mainly because they were lacking an organiser. CWA was created to nurture a safe, inclusive environment for women to get together to celebrate, discuss, collaborate and enjoy beer. We have meetups usually once a month. This has included everything from brewery tours, to beer launches, to beer tastings, to bar crawls, to bus trips, to brew days. Where possible, we are trying to select venues that support women who work in the industry, and also venues that match our ethos. 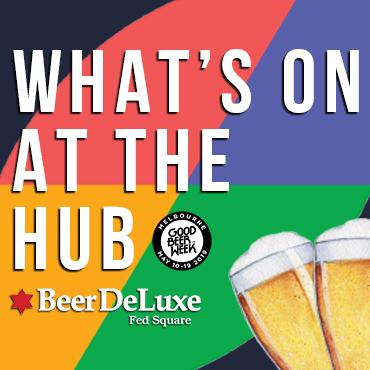 We have an exciting array of events planned in the future which will see us dive more into the sensory side of beer with food matching events, cultivate artistic flair with beer painting classes, a social camping trip, more brew days and a life drawing event! Just as craft beer is innovative, we also want to be innovative with our events and meetups. There are many women who enjoy beer. There are also many women who are new consumers. For far too long, women have not been granted equal grounds as drinkers. The whole aim of this group is not only to support the gathering of women, but also to support education and understanding of beer in a non-judgemental environment. CWA is a great opportunity to get out and support our local brewery sector, along with experiencing and learning about the vast array of beer varieties. And you never know, it just might encourage more women to get involved in the industry. WHAT'S BEEN YOUR PROUDEST / HAPPIEST MOMENT WITH CWA? It was a proud moment for me to see CWA recognised by the beer community at the recent Beeries awards night. I believe it has taken the craft beer industry to evolve the stagnant beer sector. It is a movement. And it is one that I hope will consider women as being an important part of this evolution. Thanks, Kerry. You can find out more about Chicks With Ales here and view other entries in the Craft Beer Heroes series here. If you've got someone you believe should be included, let us know.